As the genially sarcastic Archie, Ed Gardner was a product of New York's lower East Side. Noted for his stupendous misuse of the English language, the character had a penchant for succumbing to money making schemes and beautiful women�but, the actor was a brilliant and shrewd businessman. Duffy's Tavern was so popular that it spawned a hit song, a comic strip, a motion-picture, a television program, and a U.S.O. Tour. 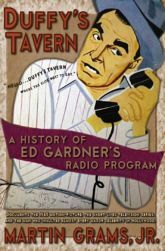 Based on a decade's worth of research, this book documents the entire history of the series, including Ed Gardner's personal life, contract negotiations and much more! Over 150 never-before-published photographs are included. Fully indexed.